I HAVE WON AN AWARD! Wow! Amazing to me, since I have only been blogging for five months. But I am "pleased as punch" to receive it from Mary at Tincantart.blogspot.com. Thank you Mary! So now I have a special message to post naming my own list of 7 of my favorite blogs, a difficult task. There are soooooo many blogs out there and each day that I sit down to explore the net, I discover more fun reads. So it is hard to choose, but a fun job because I get to explore some more in the name of research. I hope the links appear correctly and everything works, as this is my first time to do the link thing. And then I must notify them of their award. 1. 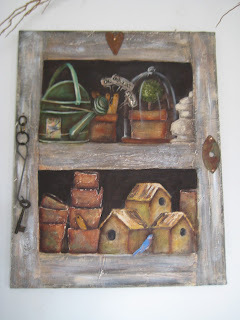 I love checking out the shrines that Mary at tincantart.blogspot.com She is so creative, you will enjoy seeing each one. 2. I really enjoy looking through the variety of pages and fun posts by nicks at http://nicksartystuff.blogspot.com/ . As part of the posting, there are a few rules to follow. And I hope each of the bloggers will follow up with an award list of their own. **1. 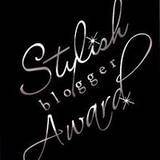 The first is to thank the blogger who named me on her list. Mary you are the best. **2. Make my own list of favorite blogs. 1. I am 60 years old and have been married for 38 years. 2. I am an "empty nester", since my two sons have left home and are pursuing their own destinies with work and college. 3. I have a bossy calico cat named Domino. 4. I am a retired art teacher and I love repeating it. 5. I am a painter and mixed media artist now that I can do my own art, but sometimes I teach or share art projects with friends. 6. I love to travel and attend art conferences or workshops. Is this a surprise? 7. I am a bit challenged on the computer, but willing to learn so I can have an even better blog and maybe learn how to use digital collage in art. So there you have it, all the bits about this fun award. Again please visit the blogs I have named above. It will be a great way to start your day with a cup of coffee or tea. And as promised a little painting from a few years back with acrylic gouache, image transfer, paper collage, and texture beads sprinkled here and there. Hope you like it. THANK YOu,Patricia! I am very honoured that you named me. I cannot seem to get into my blog,now but will publish your comment when I do. Congrats on the award! Love your painting!